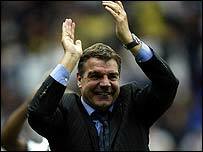 Bolton's Sam Allardyce has won the Barclaycard manager of the month award for the second time this season. Arsenal's Thierry Henry is player of the month for January after a series of outstanding performances. Bolton picked up nine points out of 12 and have also reached the Carling Cup final, where they play Middlesbrough. Henry scored three times, including the stunning 25-yard winner against Manchester City to put the Gunners top, and now has 98 Premiership goals.